Author. Educator. Father. World Traveler. EdwardFBerger.com is where I share my insights into the world of education. 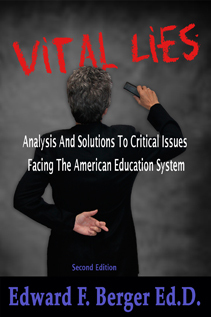 The second edition of Vital Lies will be available soon as a free download! A NATION THAT FEARS ITS CHILDREN? Copyright 2019 Dr. Edward F. Berger. Sometimes you just need to get away and sit beside a beautiful stream and sort your thoughts. My thoughts were running into each other and processing the same information over and over again. I had chased questions around and around in my head until I had to assume that very little of what I was learning made any sense. I knew I had to find a quiet place and sort out the chaos of political jargon and conflicting, often bought, bits of information coming from those who dance to tunes that have no relevance to the needs of our community and the majority of citizens. They are the politicians who want us to believe they represent something other than their own power and place in a pecking order established by the people who make no pretense of representing any interests but their own. The Greek, Diogenes, carried a lantern, even in daylight, and claimed to be looking for an honest man. He was a cynic. But in truth, I don’t want to be cynical. I believe that it is possible to find an honest politician. How can we tell those who actually put community and their fellows in front of their own selfish agendas? How can we identify the most honest among us? How do we know if they are the tools of greed, power and self-interests who say whatever it takes to con us? I listened to the ever moving waters. As Fritz Perls so clearly advises, I stopped trying to push the river. It took time as the clutter of political jargon washed away. Beyond cynicism lay clarity. With clarity came the answers I seek. Listen with your heart to the words a person striving to serve uses to explain the reason they seek public office. Are their words bent around other agendas and political ideologies? Do their words imply that we are divided – us vs. them? Republicans vs. Democrats, Liberals vs. Conservatives? Wealth and power vs. everything achieved by cooperation and building community and a nation? If you listen, it will soon be clear that those who use these techniques to exploit us can never represent us. Listen, and their agendas become clear. For example: “No new taxes” actually means, “I reject paying taxes that support the community and the common good because I have the right to prosper without paying my fair share.” “Cut support for our schools and privatize our public systems.” actually means to hell with kids, families and America, I can make money if I have access to the taxes suckers pay.” Their words and actions are very clear IF you are listening. Imagine a candidate who wants to represent and not exploit their fellows. A candidate who doesn’t play to established power groups, but sees the job of representative not as red or blue, but all shades of purple. * Imagine a candidate who represents your agenda, not for personal gain, but because that is what a representative of the people must do. Vote for that candidate! I borrowed this idea of representing everyone, not just factions, from Candidate Peter Pierson (AZ House District 1). Did You Miss The Celebration?